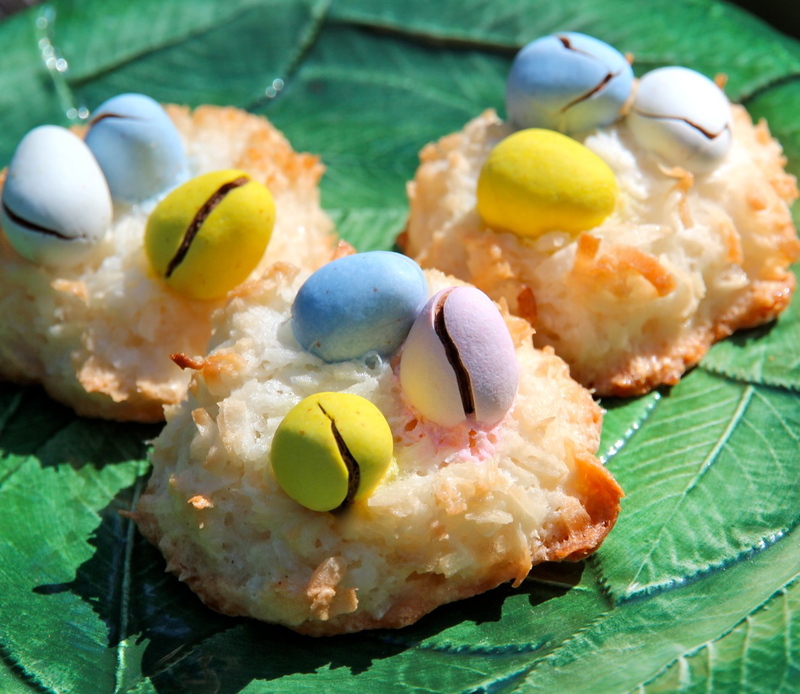 The image above is of the recipe as described, but with some candy-coated mini chocolate eggs pressed into each cookie before baking. The cracking was not expected and I deemed them a failure, but several friends loved the effect, so here you go! Simple buy a couple of bags of Cadbury Easter Candy Coated Mini Eggs, press 3 into each cookie before baking and voila! They are fine without the eggs, of course. They originally appeared in A Baker’s Field Guide to Christmas Cookies, so some of that formatting remains. You need two kinds of coconut for this cookie. The unsweetened coconut, which you can usually find in bulk sections in natural foods stores, is a very fine texture and keeps the cookie from being too sweet. It is sometimes referred to as “desiccated coconut”. The sweetened long shred “angel flake” coconut adds a chewy texture and sweetness; you can find packages of this in the baking supplies aisle in the supermarket right next to the chocolate morsels. Preheat oven to 375˚ F. Line two cookie sheet pans with parchment paper; coat lightly with non-stick spray. Whisk together egg whites, sugar and vanilla extract in top of a double boiler (not over hot water yet) until combined. Add both types of coconut and fold in until coconut is completely coated with the egg white mixture. Place top of double boiler over simmering water with the water just touching the bottom of the part that is holding the cookie mixture. Stir the mixture constantly; the sugar will dissolve and the mixture will become glossy and hot to the touch in about 3-minutes. Drop 2 tablespoon sized mounds 1 1/2-inches apart on prepared sheet pans. The cookies should be round and very 3-dimensional; do not flatten. Coax them into a neat shape with fingers if needed by pressing any stray shreds around the edges into the cookie mound. If you are making the Easter “nests”, press 3 candy coated mini chocolate eggs into each cookie. Bake for about 13 minutes or until the edges and some of the coconut shreds have turned light golden brown. Slide parchment onto racks to cool cookies completely before peeling off of the paper. (Cookies may be stored at room temperature in an airtight container for up to 4 days). Good Cookie Variation: Melt 8 ounces bittersweet or semisweet chocolate and dip the bottoms of the coconut cookies coming up about 1/2-inch. Allow excess chocolate to drip back into pot of chocolate. Place chocolate side up (they’ll kind of be on their sides) on cookie sheet and refrigerate until chocolate hardens. These are best eaten the day they are made.